In this typical Tuscan rural guest house, located in Vinci, among vineyards and olive groves in the heart of Tuscany, you will find this apartment filled with ambiance. This single-story holiday home is located on a farm totalling 6 apartments. There is a pleasant garden at our guests' disposal, with a barbecue and pool and with a wonderful view of the hillscape . Vinci is also the birthplace of Leonardo da Vinci; you can visit his childhood home as well as the Leonardo museum in the castle. The magical countryside is the same as it was in Leonardo's time. 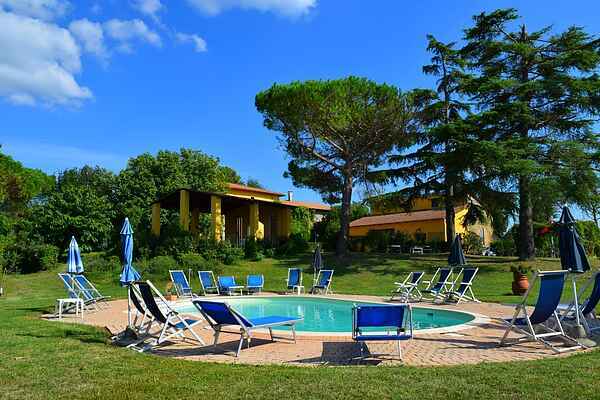 This holiday home is also ideally positioned for you to discover other famous Tuscan cities such as Florence, Pistoia, Pisa, or a little further away, Lucca and Siena as well as the rest of this beautiful region.